Certain homes really manage to capture the essence of our aesthetic sensibilities. Fabulously charismatic, cosy or comforting, these dwellings embrace our inner decorative desires and present them in a visually appealing, highly desirable package. If you're ready to check out a dwelling that bursts with luxury and opulence, then you are going to want to check out today's feature apartment. Serene and calming, the overall ambience within this home is one of comfort and lavishness. Opulent yet not excessive, the atmosphere is elegance and refined, with a true sense of homeliness and hospitality. 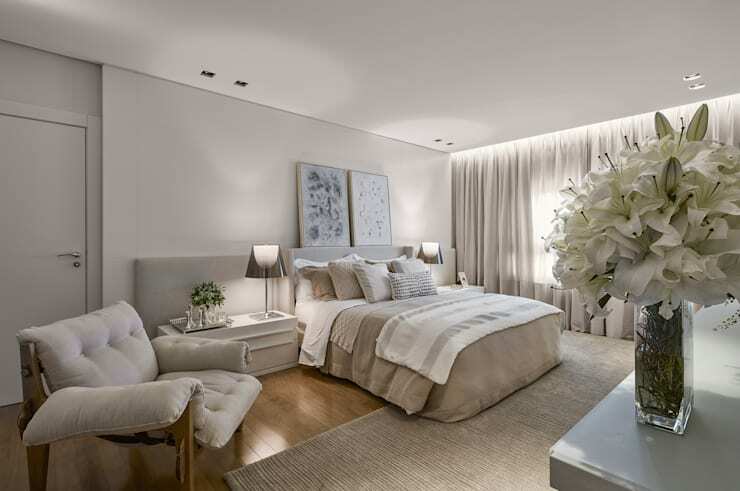 Designed by the team at Alessandra Contigli Architecture and Interiors, this large apartment of approximately 300 square metres boasts everything one might need for fabulously relaxed living. Situated in the region of Nova Lima, about 20 kilometres southeast of Belo Horizonte, the property enjoys a subdued, neutral aesthetic, with plenty of statement making features. Starting the tour in the bedroom, we're immediately given a glimpse into the lives of the lucky occupants of this home. Bursting with comfort, the soft white hues add a charming sense of opulence, while retaining cosiness and tranquility. Accessories have been added carefully and in large numbers, with throw cushions and rugs enhancing the large bed and elegant aesthetic. 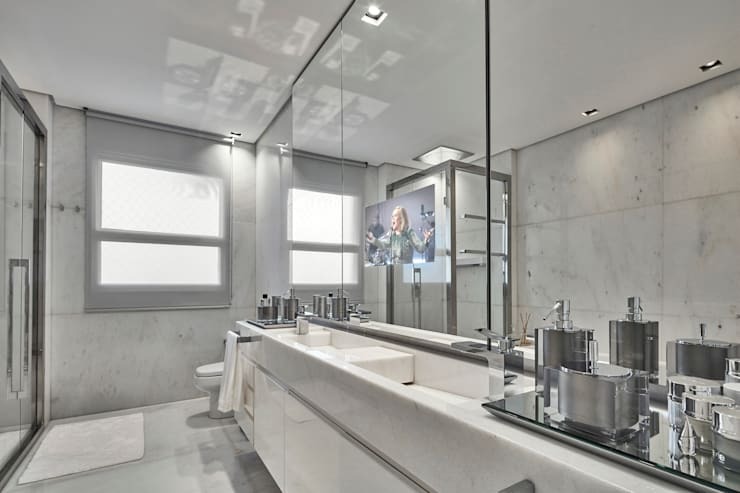 The master en suite is as impressive as the bedroom, with marble utilised throughout, along with huge swathes of mirror that increase the already large room. Sophisticated and chic, the room also includes a bathtub for relaxation, a television, and an entry-level shower. The home boasts a range of high-tech inclusions, but this is particularly noticeable in the office, where the bespoke joinery adds a LCD television, and plenty of space for more than one to study. Once again we see grey utilised as the main hue, presenting a timeless and enduring ambience. One of the two children's rooms, this first space is adorned with a pale pink colour scheme is a picture perfect. With sheer curtains, a large workspace and plenty of eye-catching features, we're sure the owner of this sleeping space is fairly impressed and content with their setup. The spacious living room is a really wonderful addition to this grand apartment, with two individual sitting areas, centred around small coffee tables. The focal point is the wall art, which frames the end of the room, and draws one's eyes immediately to the well-illuminated photography. The decor is rather simple, yet boasts eye-catching designer pieces of furniture that impress with their unique shapes and forms. 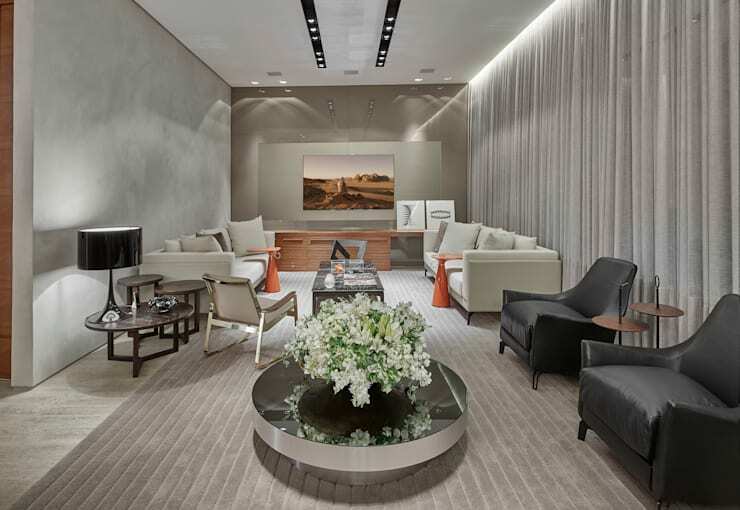 A muted grey colour scheme has been incorporated, along with floor to ceiling curtains that help elongate the perceived ceiling height within. The gorgeous dining room is really a scene-stealer! Replete with enough room to host at least 10 individuals, this long table and accompanying upholstered chairs are neat, tidy and elegant. 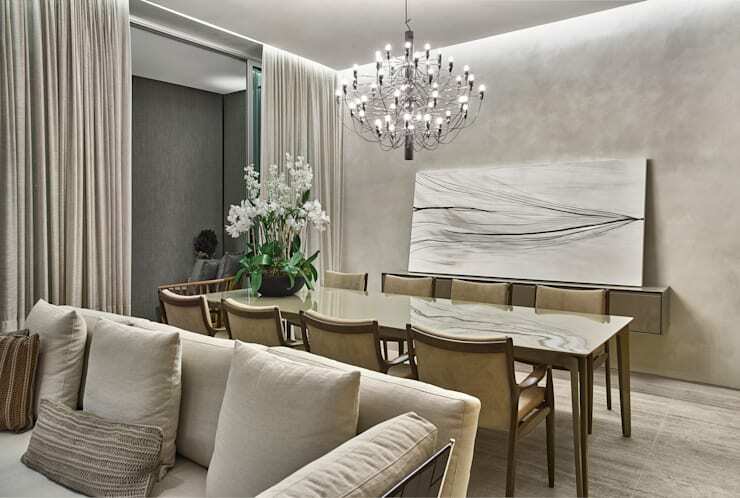 The standout items in this space are undoubtedly the chandelier that hangs gracefully above, along with the wall-mounted console that provides a space for the large artwork to sit. Throughout the home we've seen a combination of earthy tones and muted hues. These provide a range of textures, and impart warmth within the individual spaces. 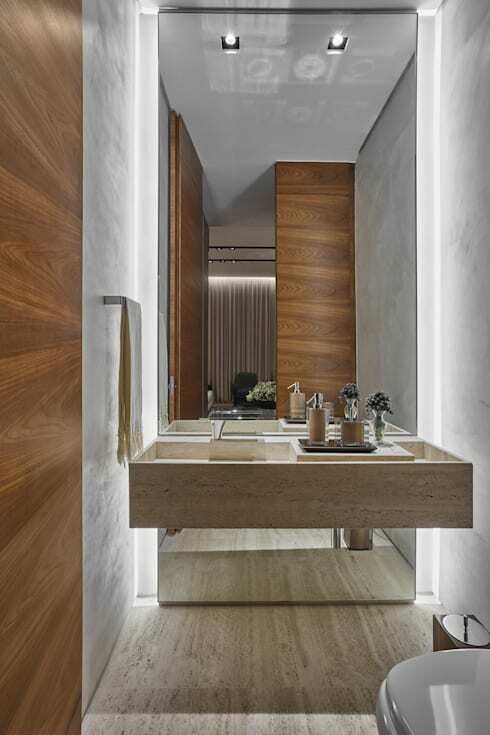 In the bathroom this is particularly visible, as the designers have employed timber veneer to the walls and doors, along with stone for the flooring and sink. Lastly, we head into the kitchen to take a peek at the sleek setup. 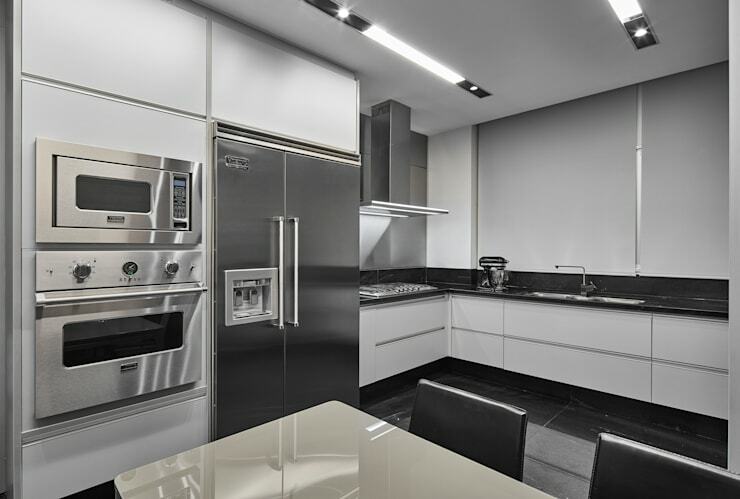 Bespoke cabinetry has been installed to add a customised efficiency within the room, while sparkling stainless steel appliances add a chic aspect to the area, along with a high level of practicality.